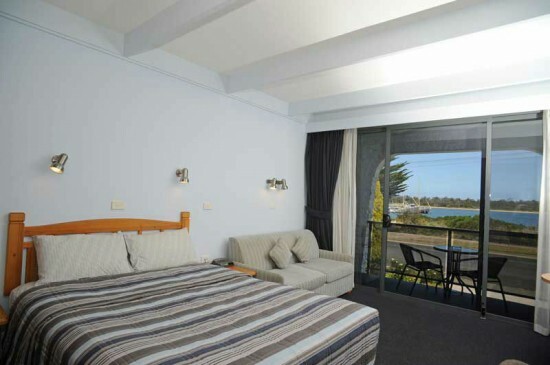 The Banjo Paterson Motor Inn is situated in the hub of Lakes Entrance. You can enjoy water views from your own balcony of our Deluxe Rooms, plus 32" LCD TV's with Foxtel and FREE High Speed WiFi are provided. Clancys Restaurant is an onsite Fully Licensed and BYO Restaurant, specialising in steak and seafood. Clancys is open 6 days a week for dinner. Banjo Paterson Motor Inn is located five minutes walk to the shopping and cafe strip of Lakes Entrance, or twenty minutes stroll to the footbridge and Ninety Mile Beach. Cruise boats are stationed nearby. All rooms have Mini Bar and free Wi-Fi with ironing facilites & guest Laundry available for use during the day. Lakes Entrance offers you activities to do during the summer or winter holiday months. Summertime is water sports and activities, going to the beach, swimming, surfing and fishing in the lakes, rivers and ocean. During the winter, stroll along isolated beaches, taking advantage of our riviera type winter weather. It hardly ever rains in this region, so winter time is days of clear blue skies with crisp mornings and chilly nights around the fire.